, archbishop of Canterbury, wag descended of a family anciently of the name of Tilston, of Tilston in Cheshire, and born at Sowerby in Yorkshire, in Oct. 1630. 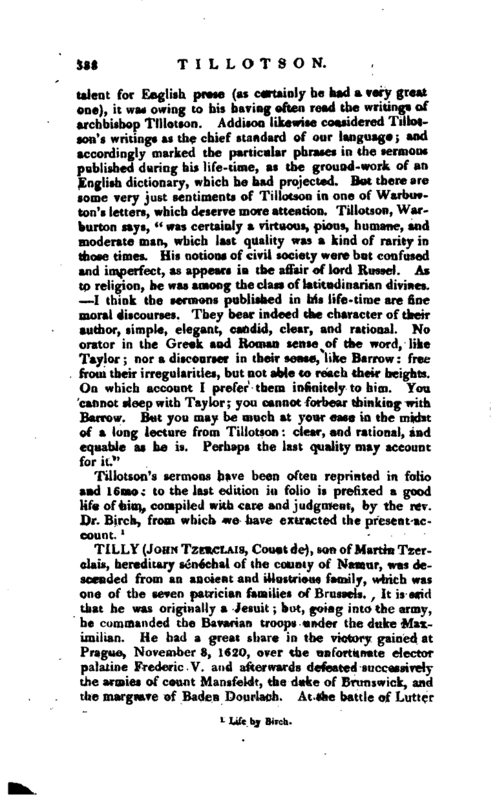 His father, Mr. Robert Tillotson, wasaconsiderable clothier there, a man of good understanding, and uncommon knowledge of the Scriptures; but so zealously attached to the system of Calvin, as not to be moderated by the reasonings of his son, whom he lived to see dean of Canterbury. He gave his son, however, a liberal education, vv, o,;fu-r passing through a school, was sent in 1647 to Onn. bridge, being then seventeen; and admitted a penftiooer oi C’are-hall. He took his bachelor of arts degree in 1650, and his master’s in 1654, having been chosen fellow of his college in 1651. His first education and impressions were among Puritans; from whose principles he gradually seceded, and is said to | have felt a great repugnance to read the works usually put into the hands of youth. Mr. Chillingworth’s works are said to have first given his mind a new bias, and dire. -ted Dim to a new method of study, and about the same time he entered into friendship with some great men, which contributed not a little to give him new views of theological matters. Cambridge then could boast of the celebrated names of Dr Cudworth, master of Christ’s-colle^e; Dr. More, and Dr. Rust, afterwards bishop of Dromore in Ireland, fellows of the same Dr. Whichcot, provost of King’s; Dr. Worthington, master of Jesus and Mr. John Smith, author of the “Select Discourses,” fellow of Queen’s. 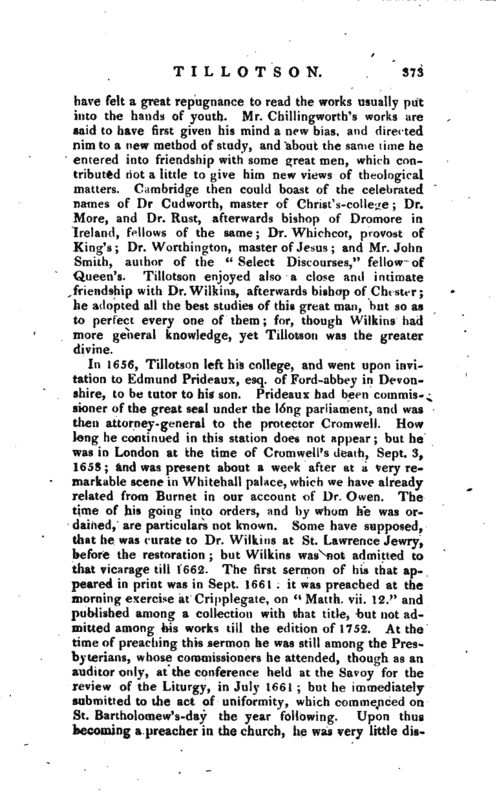 Tillotson enjoyed also a close and intimate friendship with Dr. Wilkins, afterwards bishop of Chester; he adopted all the best studies of this great man, but so as to perfect every one of them; for, though Wilkins had more general knowledge, yet Tillotson was the greater divine. 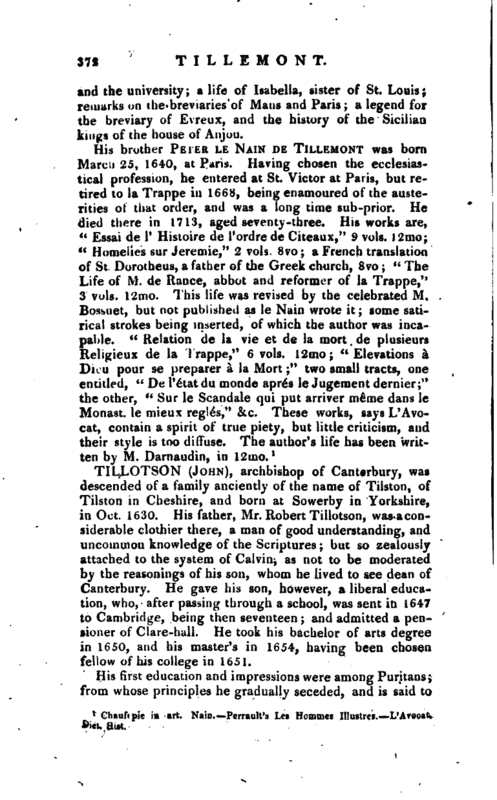 In 1656, Tillotson left his college, and went upon invitation to Edmund Prideaux, esq. of Ford-abbey in Devonshire, to be tutor to his son. Prideaux had been commissioner of the great seal under the long parliament, and was then attorney-general to the protector Cromwell. How long he continued in this Station does not appear;, but he was in London at the time of Cromwell’s death, Sept. 3, 1658; and was present about a week after at a very remarkable scene in Whitehall palace, which we have already related from Burnet in our account of Dr. Owen. The time of his going into orders, and by whom he was ordained, are particulars not known. Some have supposed, that he was curate to Dr. Wilkins at St. Lawrence Jewry, before the restoration; but Wilkins was not admitted to that vicarage till 1662. The first sermon of his that appeared in print was in Sept. 1661: it was preached at the morning exercise at Cripplegate, on “Matth. vii. 12.” and published among a collection with that title, but not admitted among his works till the edition of 1752. At the time of preaching this sermon he was still among the Presbyterians, whose commissioners he attended, thou. h as an auditor only, at the conference held at the Savoy for the review of the Liturgy, in July 1661 but he immediately submitted to the act of uniformity, which commenced on St. Bartholomew’s-day the year following. Upon thus becoming a preacher in the church, he was very little | disposed to follow the patterns then set him, or indeed of former times; and therefore formed one to himself, which was long esteemed as a model. He certainly began his course of divinity with the true foundation of it, an exact study of the Scriptures, on which he spent four or five years. He then applied himself to the reading ol all the ancient philosophers and writers upon ethics, and among the fathers chiefly St. Basil and St. Chry*.ostom, with Episcopius among the moderns, whom he made the pattern both of his principles and eloquence. With these preparations, he set himself to compose the greatest variety of sermons that any divine had yet undertaken. The year after, 1664, he was chosen Tuesday lecturer at St. Lawrence Jewry: and being now settled in town, and having established the character of an excellent preacher, he contributed his share to oppose the two growing evils of Charles the Second’s reign, atheism and popery. He preached a sermonbefore the lord mayor and court of aldermen at St. Paul’s, in 1663, “On the wisdom of being religious;” which was published in 1664, much enlarged, and has been allowed to be one of the most elegant, perspicuous, and convincing defences of religion, in our own or any other language. 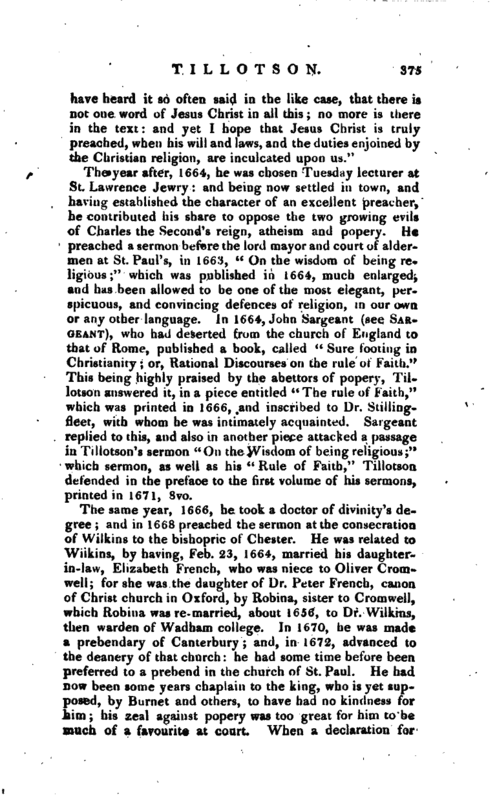 In 1664, John Sargrant (see Sar­Geant), who had deserted from the church of England to that of Rome, published a book, called Sure footing in Christianity; or, Rational Discourses on the rule of Faith.“This being highly praised by the abettors of popery, Tillotson answered it, in a piece entitled” The rule of Faith,“which was printed in 1666, and inscribed to Dr. Stillingfleet, with whom he was intimately acquainted. Sargeant replied to this, and also in another piece attacked a passage in Tillotson’s sermon” On the Wisdom of being religious;“which sermon, as well as his” Rule of Faith," Tillotson defended in the preface to the first volume of his sermons, printed in 1671, 8vo. The same year, 1666, he took a doctor of divinity’s degree; and in 1668 preached the sermon at the consecration of Wilkins to the bishopric of Chester. He was related to Wiikins, by having, Feb. 23, 1664, married his daughterin-law, Elizabeth French, who was niece to Oliver Cromwell; for she was the daughter of Dr. Peter French, canon of Christ church in Oxford, by Robina, sister to Cromwell, which Robina was re- married, about 1656, to Dr. Wilkins, then warden of Wad bam college. In 1670, he was made a prebendary of Canterbury; and, in 1672, advanced to the deanery of that church: he had some ti ue before been preferred to a prebend in the church of St. Paul. He had now been some years chaplain to the king, who is yet supposed, by Burnet and others, to have had no kindness for him; his zeal against popery was too great for him to be much of a favourite at court. When a declaration for | liberty of conscience was published in 1672, with a view to indulge the papists, the bishops were alarmed, and directed Uieir clergy to preach against popery; the king complained to archbishop Sheldon of this, as done on purpose to inflame the people, and alienate them from himstU and hit government; on which that prelate called together some of the clergy, to consider what he should say to his majesty, if he pressed him any farther on that head. 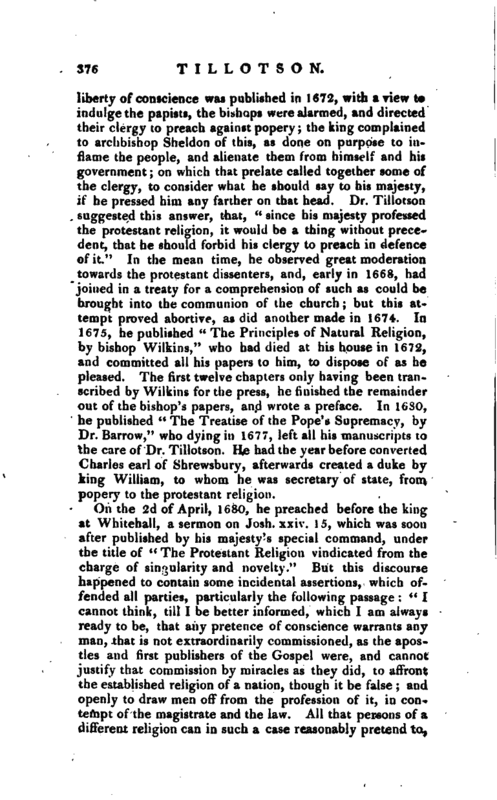 Dr. Tillotson suggested this answer, that, “since his majesty professed the protestant religion, it would be a thing without precedent, that he should forbid his clergy to preach in clefence of it.‘ 1 In the mean time, he observed great moderation towards the protestant dissenters, and, early in 1668, had joined in a treaty for a comprehension of such as could be brought into the communion of the church; but this attempt proved abortive, as did another made in 1674. In 1675, he published” The Principles of Natural Religion, by bishop Wilkins,“who had died at his house in 1672, and committed all his papers to him, to dispose of as he pleased. 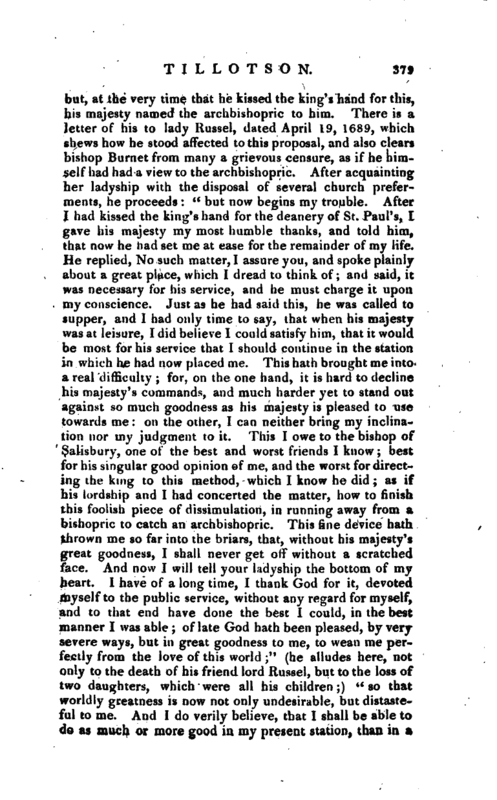 The first twelve chapters only having been transcribed by Wilkins for the press, he finished the remainder out of the bishop’s papers, and wrote a preface. In 1630, he published” The Treatise of the Pope’s Supremacy, by Dr. Barrow," who dying in 1677, left all his manuscripts to the care of Dr. Tillotson. He had the year before converted Charles earl of Shrewsbury, afterwards created a duke by king William, to whom he was secretary of state, from popery to the protestant religion. On the 2d of April, 1680, he preached before the king at Whitehall, a sermon on Josh. xxiv. 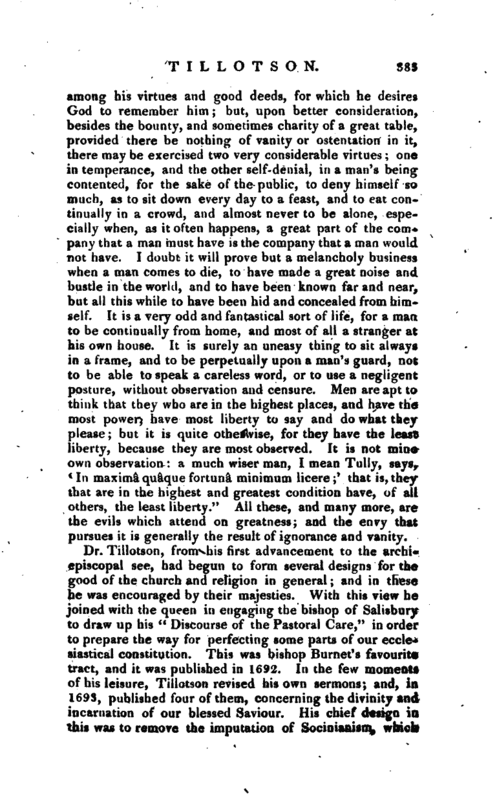 15, which was soon after published by his majesty’s special command, under the title of “The Protestant Religion vindicated from the charge of singularity and novelty.” But this discourse happened to contain some incidental assertions, which offended all parties, particularly the following passage: “I cannot think, till I be better informed, which I arn always ready to be, that any pretence of conscience warrants any man, that is not extraordinarily commissioned, as the apostles and first publishers of the Gospel were, and cannot justify that commission by miracles as they did, to affront the established religion of a nation, though it be false; and openly to draw men off from the profession of it, in contempt of the magistrate and the law. All that persons of a different religion can in such a case reasonably pretend to, | is to enjoy the private liberty and exercise of their own conscience and religion; for which they ought to be very thankful, and to forbear the open making of proselytes to their own religion, though they be never so sure that they are in the right, till they have either an extraordinary commission from God to that purpose, or the providence of God makes way for it by the permission of the magistrate.” Dr. Hickes, who wrote a virulent libel against Tillotson after his death, styles this downright Hobbism; and tells us, that a witty lord, standing at the king’s elbow when it was delivered, said, “Sir, do you hear Mr. Hobbes in the pulpit?” Dr. Calamy’s account is, that the king having slept the most part of the time while the sermon was delivered, a certain nobleman stepped up to him, as soon as it was over, and said, “It is pity your majesty slept, for we have had the rarest piece of Hobbism that ever you heard in your life.” To which the km^ answered, ll Odds fish, he shall print it then;" and immediately gave orders to that purpose. Some animadversions were made upon it, and printed; but it does not appear that the dean took any further notice, except only to apologize privately among his friends, for having advanced an assertion which he savr could not be maintained. He excused himself by the hurry he was in, being called unexpectedly, and out of turn, to preach. It is indeed surprising that a man of Tillotson’s good sense should be hurried, by his zeal against popery, to advance against the papists what equally struck at our first reformers. In 1682, the dean gave the public, from the manuscript! of bishop Wilkins, a volume in 8vo, of fifteen sermons; which he introduced with a preface, in defence of that prelate’s character, against the reflections cast upon it in the “Historia & antiquitates universitatis Oxoniensis.” Thi* was printed in 1674, under the inspection of bishop Fell; who is supposed to have made the alterations and additions, which are seen in that edition of Anthony Wood’s work. The task of preparing “Dr. Barrow’s Sermons” for the press, which had employed the dean for several years, -and cost him as much pains as would have produced many more of his own, was now finished; and the edition published at London in 1633, folio. 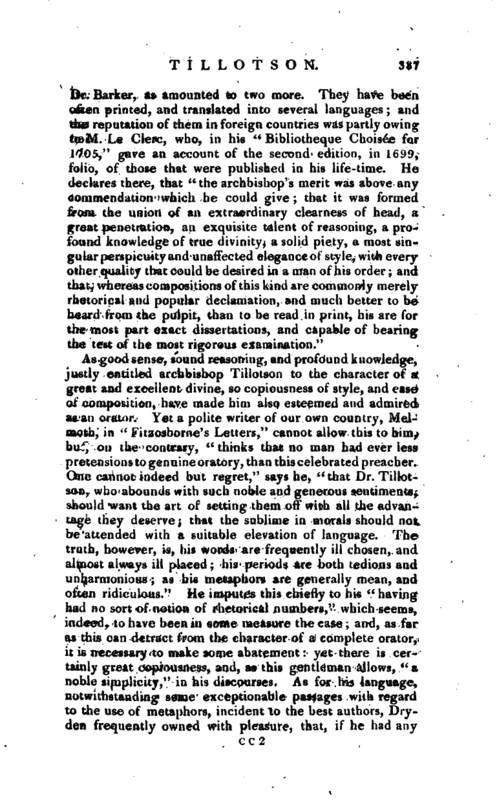 The laborious office of an editor of such voluminous writings as those of Barrow, undertaken by one who had many years before appeared to so much advantage as an original writer, was as clear an | evidence of modesty, as it was of sincere friendship, in Dr. Tillotson. The discovery of the R\e house plot the same year opened a melancholy scene, in which he had a large share of distress, on account of his friendship for lord Russel. He and Dr. Burnet were sent for by that lord, and both attended him till his death: and it i* remarkable, that they both urged him to disown the principle of resisting the powers above, for which they were severely censured, an<l doubtless afterwards felt reason to censure themselves. 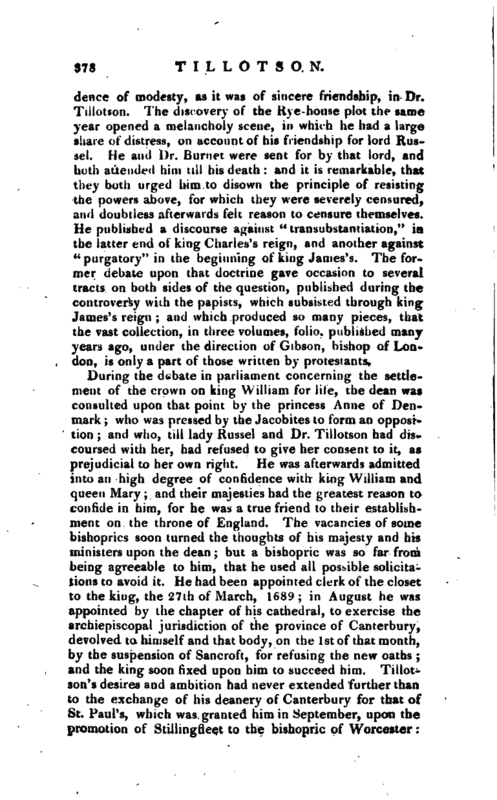 He published a discourse against “eransuh-tantiation,” in the Utter end of king Charles’s reign, and another against “purgatory” in the beginning of king James’s. 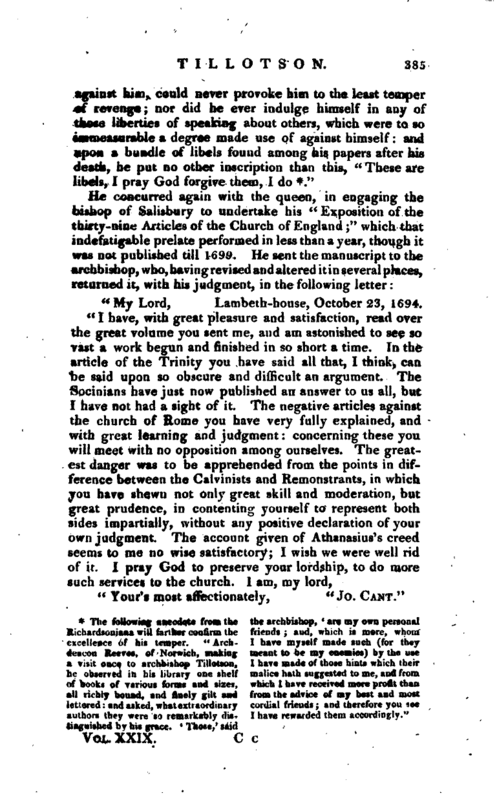 The former debate upon that doctrine gave occasion to several tracts on both sides of the question, pubii>hecl during the controversy with the papists, which subsisted through king James’s reign; and which produced so many pieces, that the vast collection, in three volumes, folio, published many years ago, under the direction of Gibson, bishop of London, is only a part of those written by protestants. A man of Dr. Tillotson’s disposition and temper, which was mild, gentle, and humane, had certainly the greatest reason to dread the archbishopric; since whoever should succeed Sancroft must be exposed to the attacks of the Nonjurors. Accordingly, he made all the struggle, and all the opposition to it, which a subject could make against his king; and, when all would not do, he accepted it with the greatest reluctance. Of this we have the following account, in another letter to lady Russel, dated October the 25th, 1690; for there was ever a strict intimacy and correspondence between this lady and Dr. Tillotson, after the death of lord Russel, and there passed several letters between them upon this occasion. “I waited upon the king at Kensington, and he took me into his closet, where 1 told him, that 1 could not but have a deep sense of his majesty’s great grace and favour to me, not only to offer me the best thing he had to give, but to press it so earnestly upon me. I said, I would not presume to argue the matter any further, but I hoped he would give me leave to be still his humble and earnest petitioner to spare me in that thing. He answered, he would do so if he could, but he knew not what to do if I refused him. Upon that I told him, that I tendered my life to him, and did humbly devote it to be disposed of as he thought fit: he was graciously pleased to say, it was the best news had come to him this great while. I did not kneel down to kiss his hand, for, without that, I doubt I am too sure of it, but requested of him, that he would defer the declaration of it, and let it be a secret for some time. He said, he thought it might not be amiss to defer it till the parliament was up. I begged further of him, that he would not make me a wedge to drive out the present archbishop; that some time before 1 was nominated, his majesty would be pleased to declare in council, that, since his lenity had not had any better effect, he would wait no more, but would dispose of their places. This I told him I humbly desired, that I might not be thought to do any thing harsh, or which might reflect upon me: for | now that his majesty had thought fit to advance me to this station, my reputation was become his interest. He said he was sensible of it, and thought it reasonable to do as I desired. I craved leave of him to mention one thing more, which in justice to my family, especially my wife, I ought to do, that I should be more than undone by the great and necessary charge of coming into this place, and must therefore be an humble petitioner to his majesty, that, if it should please God to take me out of the world, that I must unavoidably leave my wife a beggar, he would not suffer her to be so; and that he would graciously be pleased to consider, that the widow of an archbishop of Canterbury, which would now be an odd figure in England, could not decently be supported by so little as would have contented her very well if I had died a dean. To this he gave a very gracious answer, I promise you to take care of her.” His remark to the king, that “the widow of an archbishop would now be an odd figure in England,” was founded upon this fact, that only two, who had fiiied the see of Canterbury, had hitherto been married, Cranmer and Parker. The king’s nomination of him to the archbishopric was agreed between them, as it appears, to be postponed till after the breaking up of the session of parliament, which was prorogued the 5th of January 1691; and then it was thought proper to defer it stiil longer, till the king should return from Holland, whither he was then going. 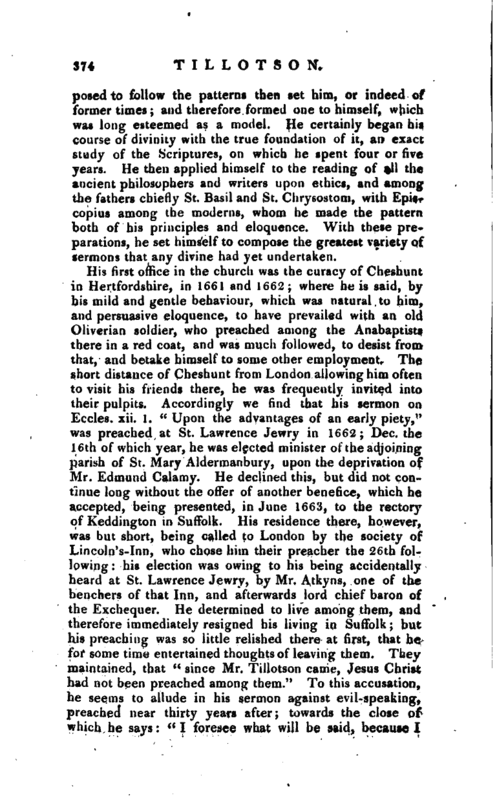 He arrived at Whitehall the 13th of April, and nominated Tiilotson to the council on the 23d, who was consecrated the 31st of May, being Whitsunday, in Bow-church, by Mews, bishop of Winchester, Lioyd, bishop of St. Asaph. Burnet, bishop of Sarurn, Stillingrleet, bishop of Worcester, Iron* side, bishop of Bristol, and Hough, bishop of Oxford, in the presence of the duke of Norfolk, the marquis of Carmarthen, lord-president of the council, the earl of Devonshire, the earl of Dorset, the earl of Macclesfield, the carl of Fauconberg, and other persons of rank; and four days after his consecration was sworn of the privycouncil. His promotion was attended with the usual compliments of congratulation, out of respect either to himself or his station, which, however, were soon followed by a very opposite treatment froai the nonjuring party; the greatest part of whom, from the moment of his acceptance of the archbishopric, pursued him with an unrelenting rage, which lasted during his life, and was by no means | appeased after his death. 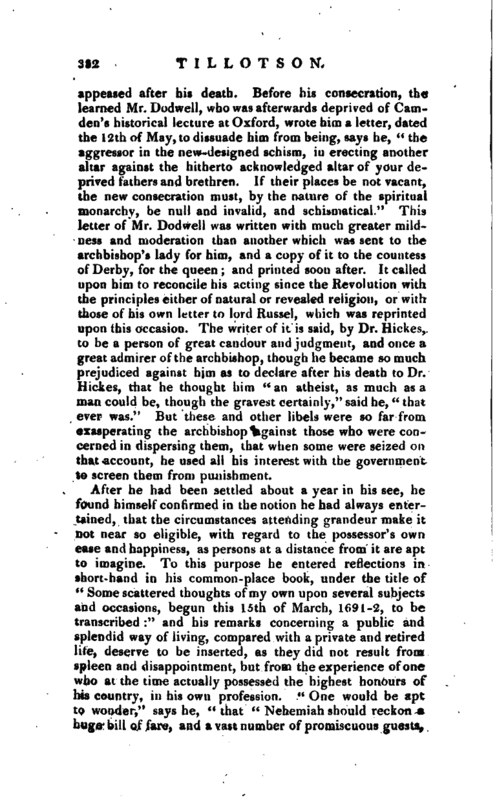 Before his consecration, the learned Mr. Dndwell, who was afterwards deprived of Camden’s historical lecture at Oxford, wrote him a letter, dated the 12th of May, to dissuade him from being, says he, “the aggressor in the new-designed schism, in erecting another altar against the hitherto acknowledged altar of your deprived fathers and brethren. 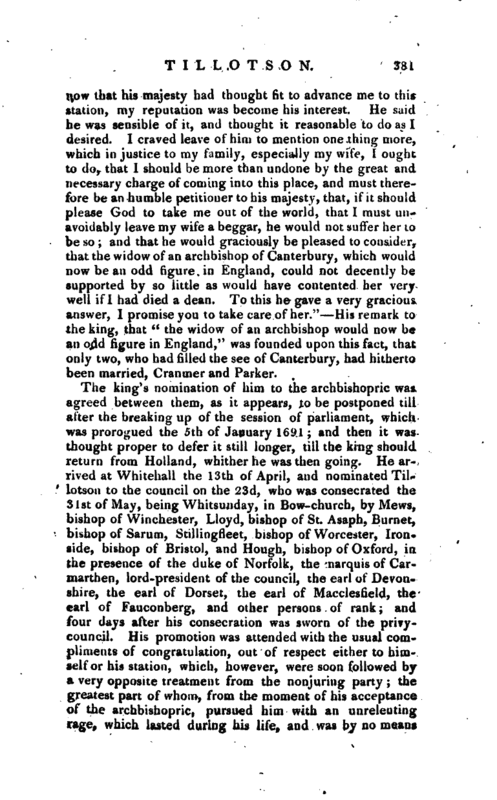 If their places be not vacant, the new consecration must, by the nature of the spiritual monarchy, he null and invalid, and schisnuitical.” This letter of Mr. Dodwell was written with much greater mildness and moderation than another which was sent to the archbishop’s lady for him, and a copy of it to the countess of Derby, for the queen; and printed soon after. It called upon him to reconcile his acting since the Revolution with the principles either of natural or revealed religion, or with those of his own letter to lord iiussel, which was reprinted upon this occasion. 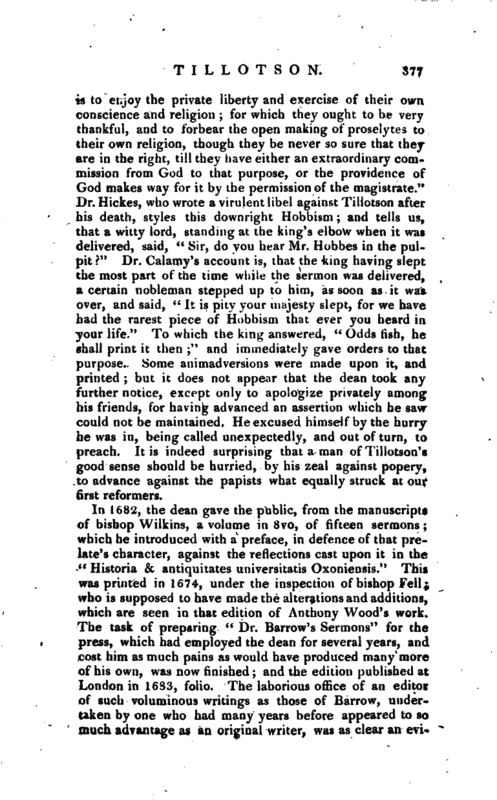 The writer of it is said, by Dr. Hickes, to be a person of great candour and judgment, and once a great admirer of the archbishop, though he became so much prejudiced against him as to declare after his death to Dr. Hickes, that he thought him “an atheist, as much as a man could be, though the gravest certainly,” said he, “that ever was.” But these and other libels were so far from exasperating the archbishop against those who wt re concerned in dispersing them, that wht n some were seized on that account, he used all his interest with the government to screen them from punishment. After he had been settled about a year in his see, he found himself confirmed in the notion he had always entertained, that the circumstances attending grandeur make it not near So eligible, with regard to the possessor’s own ease and happiness, as persons at a distance from it are apt to imagine. To this purpose he entered reflections in short-hand in his common-place book, under the title of “Some scattered thoughts of my own upon several subjects, and occasions, begun this 15th of March, 1(191-2, to be transcribed:” and his remarks concerning a public and splendid way of living, compared with a private and retired life, deserve to be inserted, as they did not result from spleen and disappointment, but from the experience ofonfe who at the time actually possessed the highest honours of his country, in his own profession. “One would be apt to wonder,” says he, “that” Nehemiah should reckon a huge bill of fare, and a vast number of promiscuous guests, | among his virtues and good deeds, for which he desires God to remember him; but, upon better consideration, besides the bounty, and someiimes charity of a great table, provided there be nothing of vanity or ostentation in it, there may be exercised two very considerable virtues; one in temperance, and the other self denial, in a man’s being contented, for the sake of the public, to deny himself so much, as to sit down every day to a feast, and to eat continually in a crowd, and almost never to be alone, especially when, as it often happens, a great part of the company that a man must have is the company that a man would not have. I doubt it will prove but a melancholy business when a man comes to die, to have made a great noise and bustle in the world, and to have been known far and near, but all this while to have been hid and concealed from himself. It is a very odd and fantastical sort of life, for a maa to. be continually from home, and most of all a stranger at his own ho use. It is surely an uneasy thing to sit always in a frame, and to be perpetually upon a man’s guard, not to be able to speak a careless word, or to use a negligent posture, without observation and censure. Men are apt to think that they who are in the highest places, and have the most power, have most liberty to say and do what they please; but it is quite otherwise, for they have the least liberty, because they are must observed. It is not mine own observation: a much wiser man, I mean Tully, says, * In maxima quaque fortuna minimum licere;’ that is, they that are in the highest and greatest condition have, of all others, the least liberty." All these, and many more, are the evils which attend on greatness; and the envy that pursues it is generally -the result of ignorance and vanity. Dr. Tiilotsun, from his first advancement to the archiepiscopal see, had begun to form several designs for the good of the church and religion in general; and in these he was encouraged by their majesties. With this view he joined with the queen it) engaging the bishop of Salisbury to draw ii:> his “Discourse of the Pastoral Care,” in order to prepare the way for perfecting some parts of our ecclesiastical constitution. This was bishop Burnet’s favourite tract, anJ it was published in 1692. In the lew moments ofh s i.-i“;?‘<*, Tiliotson revised his own sermons; and, in 1693, published four of them, concerning the divinity and incarnation of our blessed Saviour His chief design in this was to remove the imputation of Socinianism, which | had long been, and was then more than ever, fixed upon him by those who did not love his principles, and thought that his defending religion upon what were called rational grounds, and his holding friendship and correspondence with Locke, Limborch, Le Clerc, and others who did the same, were circumstances liable to suspicion. 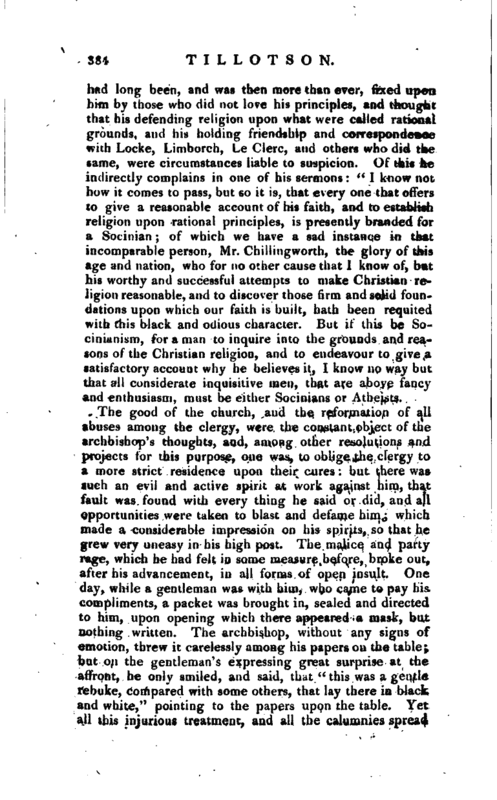 Of this he indirectly complains in one of his sermons:” 1 know not how it comes to pass, but so it is, that every one that offers to give a reasonable account of his faith, and to establish religion upon rational principles, is presently branded for a Socinian; of which we have a sad instance in that incomparable person, Mr. Chillingworth, the glory of this age and nation, who for no other cause that 1 know of, but his worthy and successful attempts to make Christian religion reasonable, and to discover those firm and solid foundations upon which our faith is built, hath been requited with this black and odious character. But if this be Socinianism, for a man to inquire into the grounds and reasons of the Christian religion, and to endeavour to give a satisfactory account why he believes it, I know no way but that all considerate inquisitive men, that are above fancy and enthusiasm, must be either Socinians or Atheists. "My Lord, Lambeth-house, October 23, 1694. “Your’s most affectionately,” Jo. Cant." authors they were so remarkably dis- I have rewarded them accordingly.‘ 3 tinguished by his grace.- * Those,’ said | He did not long survive the writing of this letter; for, Nov. I 8th following, he was suddenly seized with an illness, which, turning to a dead palsy, put an end to his life on the 24th, in the sixty-fifth year of his age. He was attended the two last nights of his illness by his dear friend Mr. Nelson, in whose arms he expired. The sorrow for his death was more universal than ever was known for a subject: anil his funeral was attended by a numerous train of coaches, filled with persons of the first quality, who went voluntarily to assist at the solemnity. 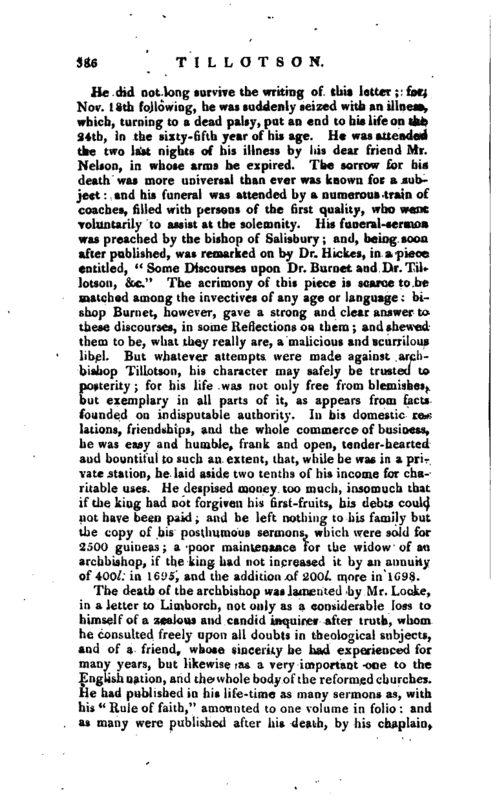 His funeral-sermon was preached by th^ bishop of Salisbury; and, being soon after published, was remarked on by Dr. Hickes, in a piece entitled, “Some Discourses upon Dr. Burnet and Dr. Tillotson, &c.” The acrimony of this piece is scarce to be matched among the invectives of any age or language: bishop Burnet, however, gave a strong and clear answer to these discourses, in some Reflections on them; and shewed them to be, what they really are, a malicious and scurrilous libel. 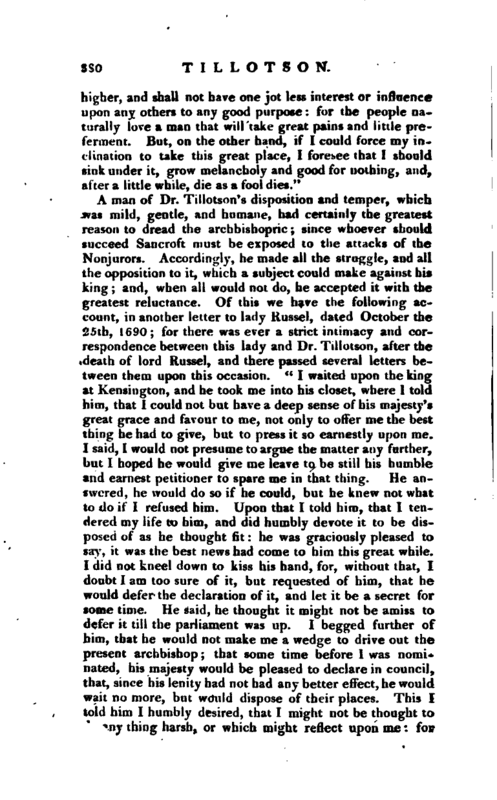 But whatever attempts were made against archbishop Tillotson, his character may safely be trusted to posterity; for his life was not only free from blemishes, but exemplary in all parts of it, as appears from facts founded on indisputable authority. In his domestic relations, friendships, and the whole commerce of business, he was easy and humble, frank and open, tender-hearted and bountiful to such an extent, that, while he was in a private station, he laid aside two tenths of his income for charitable uses. He despised money too much, insomuch that if the king had not forgiven his first-fruits, his debts could not have been paid; and he left nothing to his family but the copy of his posthumous sermons, which were sold for 2500 guineas; a poor maintenance for the widow of an archbishop, if the king had not increased it by an annuity of 400l. in 16‘jo, and the addition of ’200l. more in 1C98.